We hope you are as excited as we are! 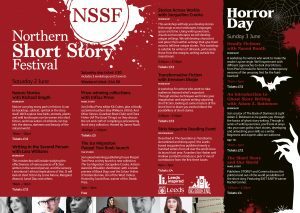 The Northern Short Story Festival 2018 is nearly here, over the weekend of 2-3 June at the Carriageworks Theatre, Leeds!! There’s just so much going on. We hope to see you there. 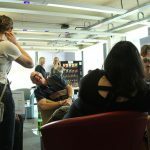 Not only do we have amazing workshops from Richard Smyth (sold out), Lara Williams (sold out), Jacqueline Crooks (sold out), Irenosen Okojie, Naomi Booth (sold out) and Adam Robinson but we also have 2 expert panel events with Clare Fisher, CG Menon and Kit Caless (Influx Press), and Rachel Connor, STORGY and Comma Press. There’s also a free book launch of The Ice Migration by Jacqueline Crooks (Peepal Tree Press) and a performance event with contributors from Strix Magazine, shortlisted for the Saboteur Awards 2018. There are still plenty of tickets left including weekend passes. For more information, click here. If you aren’t able to attend any of the events, there will be the #NoShoStoHub on Saturday 2 June all day in the bar of the Carriageworks. Pop in and buy books from Peepal Tree Press, STORGY, Valley Press, Armley Press and Waterstones. Write some fiction yourselves at the #FoundFiction writing desk. 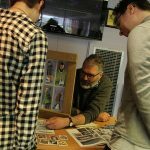 Meet author and illustrator Si Smith and have a go at printing. Hang out with writers and debut and established authors. 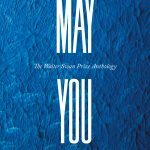 Tuesday 22 May: The Walter Swan Short Story Competition Prize Giving and May You Anthology Launch at the Leeds Library (Commercial Street, not Central Library). Free event but booking required. More information here. 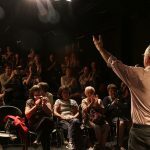 Tuesday 29 May : Flash Fiction Slam at the Hyde Park Book Club. More information here. 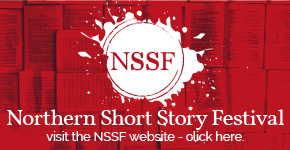 The Northern Short Story Festival is a partnership venture between the Leeds Big Bookend, Leeds City Council and Fictions of Every Kind, with funding from Leeds Inspired. The Festival’s Director is Leeds author SJ Bradley.